“Gene Cards” by E.E. 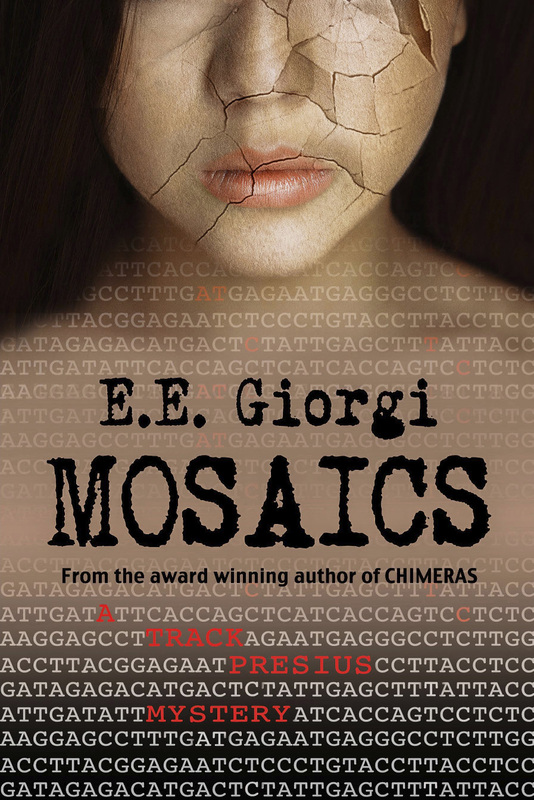 Giorgi is a dystopian futuristic thriller with a great plot, excellent characters and suspense. Told in chapters focusing on different characters the book instilled an immediate sense of closeness to the characters. First we meet Yulia Szymanski in an action packed opening sequence but she is not the heroine of the book per se. Next chapter, we meet her brother Julian, in a high security jail and with a rare genetic condition. Only then do we meet Biothreat Agent Skyler Donohue, a particularly interesting character and the ultimate heroine of the book. 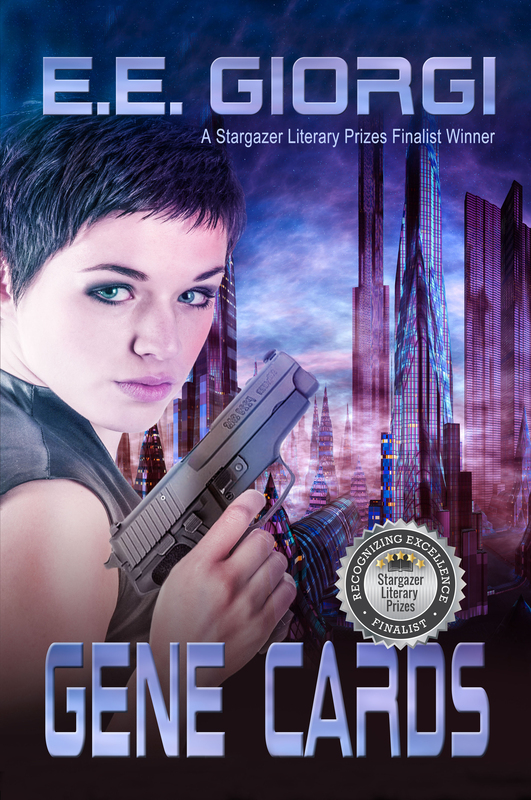 The futuristic setting impressed me particularly as genetic engineering is no longer an implausible ploy for a plot and Giorgi’s background as scientist clearly shows with competently written passages that lend the story credibility and power. Our world as it might be is written with a solid basis in science and – unfortunately – reality. Giorgi plays with established and some new ideas, creative and original, and that brought some worrying and interesting thoughts to my mind. A fascinating setting, a tight action packed plot, good drama and excellent female lead characters with bite, inner conflicts and great personal backgrounds make this a gripping and hugely enjoyable read. Highly recommended. I was born in the U.K., grew up in Tuscany (Italy) and lived in 3 different European countries and 4 different American States before settling in Northern New Mexico. I trained as a mathematician, but I gradually shifted to biology—computationally biology, to be precise. What that means is that I get to spend most of the time in front of a computer instead of a wet lab. My training as a scientist influences my writing, too, because I have a compulsion to research everything. Science always plays a fundamental role in my plots, whether it’s a virus, a genetic condition, or a medical discovery. I’ve been writing since I was a kid but back then I used to write short stories in Italian. I never finished a book until 2008. That’s the year when the story that had been brewing in my head for decades decided to come out. By then I had been living abroad for over 10 years and Italian was no longer my preferred language. So I wrote that book in English and then buried it in a drawer because it was (still is) the worst thing I ever wrote. I don’t regret writing it, though, because it taught me a lot. And somehow, once that story came out, it “uncorked” a tsunami of ideas. I’m still trying to catch up with all those ideas, in fact. Tell us about your Gene Cards. When did you have the first idea for it? And how did you decide on the characters, plots and title? The title comes from the human genetic database called “Gene Cards.” Ever since I discovered the website I thought it would make a great book title. How that became my book, though, is a bit convoluted. I wrote the first scene in June 2011: our whole town had been evacuated because of a wildfire. It was scary. Writing the scene where Yulia downloads the last bits of data before her apartment complex is destroyed by the blaze was cathartic. I then set the scene aside because I was finishing Mosaics, and it wasn’t until one year later that I came back to those pages and turned them into a novel. The title Gene Cards seemed befitting when I decided that in this new world I was creating identities were based on DNA. The Gene Cards would be the equivalent of our current ID’s, i.e. passports and driver’s licenses. When did you decide to write science fiction? Would you consider writing outside of the genre? I love science, it’s what I do everyday for a living. Genetics in particular is my daily inspiration. It triggers so many ‘what if’ questions that it’s hard for me not to stop and come up with alternative stories and scenarios. As a consequence, science fiction ‘happened’ rather than just being a conscious decision. My books often intertwine with mystery and thriller, but I’m definitely open to other genres, too. There is a science side to the story, a futuristic side and a family / personal side. Which one are you most comfortable with? Definitely the science part. I always add a personal side to my characters to give them a third dimension, so to speak, though I risk having characters that don’t always resonate with readers. I don’t like flat characters or 100% heroes. Every person has some good and some bad deep inside. Would you say there is a message in your books beyond the story? Do you find it is well received and picked up by the readers and reviewers? My main message in Gene Cards is that our Earth is dying and I don’t think people are sticking together in a strong enough way that will allow us to save our planet. What I envision happening is what I describe in the book: the rich getting richer and the poor getting poorer and cast away. I hope I’m wrong. I hope our children will still enjoy the planet the way we enjoyed it. Did you have it all planned out before you write your stories or do the characters and story surprise you? Which part are you most proud of? The city of Liasis. My previous books are mysteries set in Los Angeles. For those books, I researched everything and only made up the plot. When I started writing Gene Cards I knew I wanted a book set in the future but soon realized I had to build a whole new world. It was daunting at first, but once I started getting some ideas I ran with them and ended up having a lot of fun. It’s not hard to imagine that our near future will be filled with advertisement everywhere (wait until we get it on toilet paper!) and zero privacy. Definitely the medical examiner, Dr. Erasmus Montoya. He’s eccentric, a bit of a weirdo, and I managed to describe him without ever using the word dwarf in the whole book. What would your character(s) say about you? I love that I get immerse myself in other people’s life and stories, and that I get to imagine new worlds. I hate that I hardly have enough time to do it. The background image is absolutely fantastic and was created by Yvonne at www.diversepixel.com, she’s a fantastic artist. I added the model and the gun. I was lucky to find a model that looks exactly the way I imagined Skyler to be. What is your writing environment like? Do you need silence or music to write? I have a messy and cluttered desk. I jot notes on tiny pieces of paper that I invariably lose, and I have jazz playing on the stereo all the time. Gabriel Garcia Marquez, Jorge Luis Borges, Lewis Carroll. I also love Raymond Chandler’s witty and melancholic prose, it’s one of my favourites in the noir genre. I got to meet so many over the past year, and I must say, what I love the most is how supportive we all are of one another. I love Jason Gurley, Samuel Peralta, Michael Bunker and Nick Cole (Nick is actually a hybrid writer) for their top-notch prose. I’ve truly enjoyed books by Anthony Melchiorri and Nick Smith, who write genetic/medical thrillers similar to mine. And I’m indebted to Autumn Kalquist, Chris Pourteau, and many others for the incredible support they’ve given me. I sit in front of a computer all day and analyse genetic data. Together with my supervisor and colleagues, we are working on HIV vaccine design, so while my job can be tedious and frustrating, it does feel good to know that it’s for an important cause. Hot, possibly with a beach. Hmm, the oddest I guess would be the fact that I’m a bit unsociable and that I do too many things. The best I hope it’s that I’m a good friend. Alpha by Vangelis. Not for the whole book, but for the night views over the city. That’s a great question! 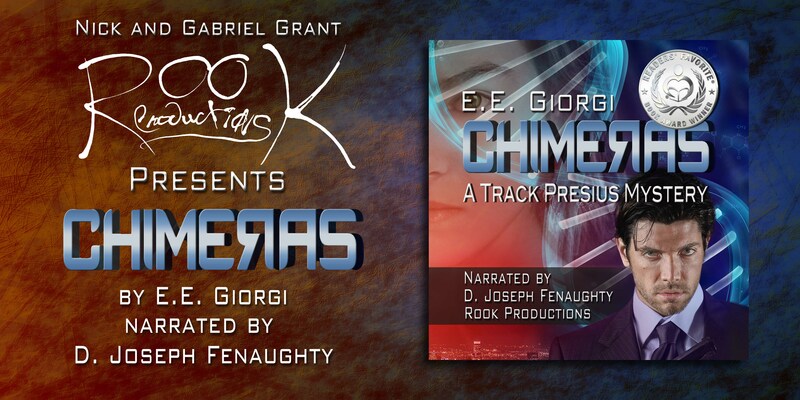 I had a chance to build a thick skin when my first book, Chimeras, was on submission through my agent. At the time I had the naïve conception that publishers want to make the best possible stories, and when they suggest edits is to make the story better. After two years of “do X” and “do the opposite of X” I lost faith in the system. Books, plots, characters – they are all very much subjective. Yes, you can usually tell a good story from a bad one, but once you have a well developed plot, 3D characters, and a good premise, you are out there to get it all, from high praise to hard slamming. So, back to your question: criticism of the type, “You can’t do that,” or, “This doesn’t work,” without any reason appended I simply ignore. I know there will always be someone who will feel like that about something. In fact, any kind of emotion I am able to elicit, even if the emotion is negative, it’s actually high praise. It means I’ve struck a chord. On the other hand, the true and priceless criticism is the constructive kind, the kind that tells you, “Your character here is too weak because she’s acting like a 2-year-old when instead she should really stand up for herself.” You know, the kind of criticism that tells you exactly what is not working and why. Criticism like this is hard to find because while readers may or may not resonate with the story, most of them are unable to give you a reason. I’m finishing a book for the Apocalypse Weird world created by Nick Cole and Michael Bunker. I’ve also started a YA story that I would like to finish as soon as I’m done with this current project. And after that I want to work on a sequel for Gene Cards. I have some ideas but I haven’t had the time to put them into writing yet. I thoroughly research everything in my books. That doesn’t mean I don’t make mistakes, but I do put a lot of thought into what I write. I hope it shows. This sounds fascinating. Thanks Christoph, for this introduction to E.E. Also it’s nice to meet someone else who was drawn to New Mexico. To borrow from John Denver, it was like “coming home to a place (I’d) never been before.” Now one of my greatest regrets is that I ever left. Thanks so much Christoph for the beautiful review of Gene Cards and for the interview!